Los Angeles Dentist - Los Angeles Cosmetic Dentist and General Dentistry. Dentist In Los Angeles. 8:00a.m. 8:30a.m. 9:00a.m. 9:30a.m. 10:00a.m. 10:30a.m. 11:00a.m. 11:30a.m. 12:00p.m. 12:30p.m. 1:00p.m. 1:30p.m. 2:00p.m. 2:30p.m. 3:00p.m. 3:30p.m. 4:00p.m. 4:30p.m. 5:00p.m. 5:30p.m. 6:00p.m. 6:30p.m. 7:00p.m. 7:30p.m. 8:00p.m. Z Dental Group is Open Everyday from 8a.m. to 8p.m. Dentist open on Sunday in Los Angeles. Z Dental Group is a prime, modern, high-tech dental office. We utilize the newest technologies available today to dentists and use only the best dental materials and supplies in our Los Angeles Dental Office. The entire dental staff at Z Dental Group is passionate about providing the best dental services to our patients. Along with restoring patient's teeth and gums to health, Z Dental Group Dentists also focus on preventative care and patient education which are among the first priorities for us. 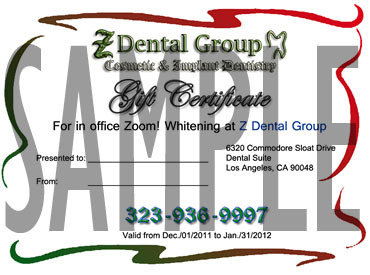 New offer from Z Dental Group! Give The gift of Beautiful Smile to your friend, family member or lover. Call us and we will email you the Gift Certificate. Now you can smile with the confidense of a straight, beautiful teeth with Invisalign. Just call our Los Angeles Dental office today and we’ll evaluate your smile at a no-charge Invisalign consultation. Z Dental Group is specializing in Invisalign which is a virtually invisible solution, so you can smile confidently both during the treatment and after. Invisilign is confortable to wear and easy to live with. Using a series of clear, removable aligners, Invisalign gradually moves your teeth toward the smile you've always wanted. And almost no one will know you are wearing them unless you tell them. Z Dental Group is a 24 hour emergency dentist, and we accept new patients for emergency dental procedures. Our dental office is open every day of the week, including Saturday and Sunday, for dental emergencies. At Z Dental Group, an emergency dentist is on call 24/7. If you are not sure what constitutes a dental emergency, remember this, if it hurts it’s a dental emergency. Z Dental Group’s emergency dentists can provide you with the fast and immediate emergency dental service, as well as restorative and cosmetic dentistry. To attain perfection, we hired well-experienced and knowledgeable dentists and dental professionals and use cutting-edge equipment, the best materials and the finest instruments. We address our patients’ questions and concerns, and educate and help them to sustain their dental health. Our orientation on cosmetic and aesthetic procedures additionally supports our dedication to offer the best dental care in Los Angeles, and to help our patients to attain the perfect looks. 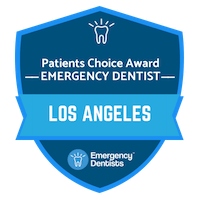 Choose Los Angeles dentist Z Dental Group for all your Cosmetic Dentistry, Dental Crown, Dental Bridge, Root Canal Therapy, ZOOM Teeth Whitening, Dental Veneers, E-Max Porcelain Crowns and Periodontal needs. Call us today, reward yourself, (323) 936-9997. Z Dental Group is a Green Dentist. We are 100% paperless, and we utilize the best modern technologies and dental equipment in our dental office. 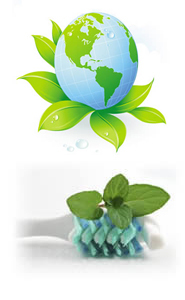 We wish to significantly lessen the ecological waste and keep our planet safe. Green Dentistry reduces waste and pollution, saves the trees, water, and energy, incorporates high-tech and is wellness based. The friendly atmosphere in our newly remodeled and clean dental office puts our patients at ease the moment they enter our Dentistry. The waiting room is never crowded and we don't cause any trouble by scheduling timely appointments with the best Dentist In Los Angeles. Z Dental Group is providing numerous specialties & dental treatments including Esthetic and Cosmetic Dentistry, Root Canal Therapy, Crown and Bridge, Dental veneers, Teeth Whitening, Porcelain Crowns, Periodontics, Prosthetics and Pain Management. You don't have to be a celebrity to be treated right, in our dental office. As soon as you walk into our Los Angeles dentist office you are the most important person. We pride ourselves in our ability to make you feel welcome and comfortable. Our dentists' and dental staff's approach assures your involvement in every dental decision, from determining your needs, to establishing a dental care plan. We are committed to providing the best dental care in professional manner meets the higher standards, as a Los Angeles Dentist. We guarantee you will get the best available dental service at the most affordable prices. Z Dental Group is offering an Invisalign special.